What would you wear when going out on a vendetta to avenge your father? Some people keep it simple with a black cloak and an even blacker attitude. Others might wear something more casual so that the perpetrator would never see you coming. After all, who would expect that the guy who's wearing wine-stained red velvet and singing bawdy songs with the barmaid in a local tavern is actually keeping an eye out for the dastardly tyrannical sheriff to show up and get his comeuppance? All that really matters is making sure you've got the right attitude and the correct gear to keep your vengeance-seeking weapon close. This sword holster slides onto any belt for easy toy sword transport. The dark faux leather will match many Medieval costumes from the Count of Monte Cristo to a classic Joan of Arc costume. It's the perfect accessory so that you don't need to worry about dropping your toy sword as you gallivant around all night. When you're diving into the swordplay lifestyle, there's a lot to take in. You've got to figure out your crouched fighting-stance and how to perfectly twirl your mustache. At least you don't have to worry about making a fool of your dignified Musketeer look as you drop your sword while crossing the street. 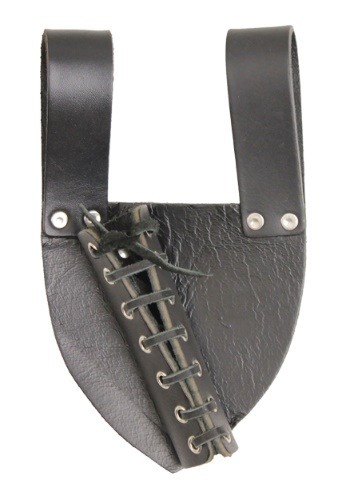 Stick your plastic blade in this faux leather holster and you'll look sharp while remaining prepared!